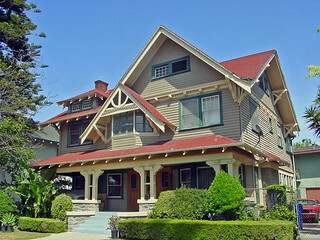 We know this house, because we first saw it in an early 1900's promotion of a nearby tract called West Adams Heights. The house in the photo is reverse, but that wasn’t uncommon for the time. If it’s the same house (and we’re pretty sure it is), then it was built earlier and probably moved to this location in 1912, when the main streets around West Adams Heights were beginning to go commercial. After further investigation, if it turns out to be the same house, then it was probably built around 1905 by the architecture team of Dennis and Farwell. Anyone up for a friendly wager? Gracing the corner of 27th and Van Buren Place is the Furlong House, designed in the local vernacular, a transitional Victorian/Craftsman style, by prolific architect Frank M Tyler. The house is named for the second or third owner, Thomas J Furlong, who was the city clerk and treasurer for the city of Vernon, until the 1950's. According to the 1915 city directory the home’s occupants were Shelly W and Bella Keiser, and were believed to live here 1910 to 1921. Mr. Keiser was in real estate and loans. Ribbed siding, rather than shingles, the shape and size, and the charming front window make this Victorian/Craftsman house appear more Victorian than Craftsman. Small windows tucked up under the eaves in various places give it a whimsical touch. According to the 1905 City Directory this was the home of Dr. And Mrs. Willis E Hutchason, Mr. Hutchason being a dentist. Later, in the 1920's and 30's it was the home Albert and Alice Cheep (and 8 children), according to the 1935 Blue Book. In between, the 1909 City Directory a lists Mrs. Blanch Trimble. Nestled in among the trees (and hard to photograph) is the lovely transitional Victorian/Craftsman owned by W. R. And Anna F. Leeds from 1903 to 1909. Mr. Leeds was an attorney. From 1909 to the 1920's George D. And Elizabeth R. Cadwalader made I their home. Mr. Cadwalader was involved with the general machinery at the Los Angeles Brick Co.